We landed in Auckland late on Saturday afternoon, the temperature was about 16 degrees and we felt rather under dressed having left Fiji in shorts and t-shirts; we had to decide between being over-dressed leaving Matamanoa and under-dressed arriving in NZ and went for the second option. No problem though, there was a driver waiting for us complete with all the paper work for our time in NZ, hotel bookings, car hire details, road atlas and guide book. 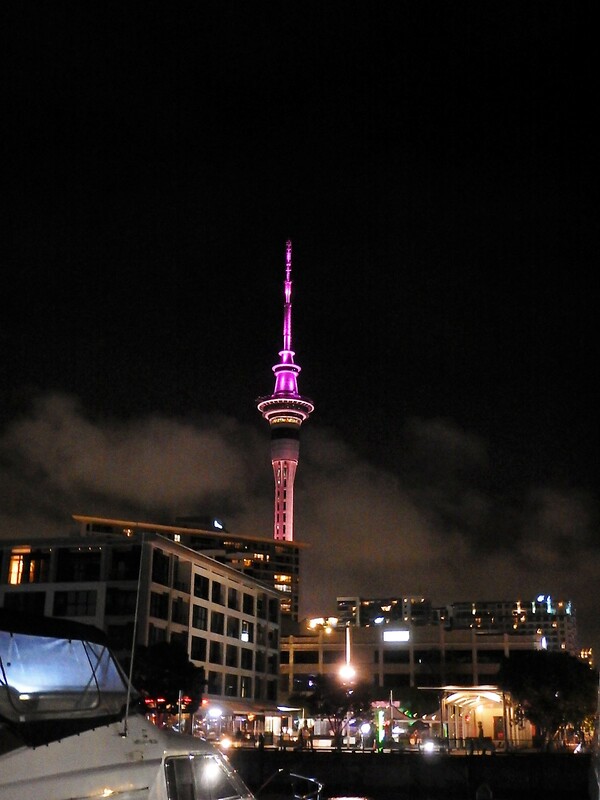 A 30-minute drive took us to the Sebel Hotel on Viaduct Harbour, a new marina built to support the Americas cup race. We checked in, cheered when we found a washing machine and tumble dryer in our suite, changed into long trousers and headed out to explore. Viaduct harbour is a social hub with lots of bars and restaurants, we had a look around and then walked along the harbour front (cruise terminal and centre for ferry routes around Auckland harbour and out to the islands) as far as Queens Street – Auckland’s answer to Oxford St in London. Time was getting on so on a whim we walked in to White and Wong’s, a smart looking Chinese restaurant next to the Maritime Museum. We only ordered two dishes and some rice but the food was really excellent. Back at the hotel we watched some TV and settled in for a good night’s sleep. Sunday morning, we went out to look for a supermarket to stock up on a few basics – we had a kitchenette in the room, we couldn’t find one (we did later) but in the search we walked most of the length of Queen Street and stopped for breakfast in a little Victorian arcade. We did find a branch of Specsavers which was handy as I needed new contact lens solution and was wondering what brand to buy, it hadn’t occurred to me that I might be able to get my usual sort! The weather started to close in (‘April’ showers) so we headed back to the hotel and made a start on the laundry. When we arrived in Auckland we had picked up an email from Mike and Jill, a couple we met at the Seabreeze Resort in Samoa inviting us over for dinner on Sunday night. We were very happy to except and Mike picked us up from the hotel on Sunday afternoon and drove us out to their beautiful house in Greenhithe across the Harbour Bridge from the city. We had a lovely evening sampling NZ wine and putting the world to rights. Jill cooked lamb shanks for us and we had homemade ice-cream for dessert, everything was delicious and it was really nice to be in a home rather than a hotel for an evening. Monday morning, we found a coffee shop near the hotel and spent some time pouring over the road atlas and exploring the directions for our road trip around New Zealand, it definitely felt like we were moving on to a new leg of our journey. While we were in Samoa we had booked a table for lunch in the revolving restaurant, Orbit 360, at the top of the Sky Tower; the website requested ‘the highest standard of dress’ so we scrubbed up, Mark put on his suit and we set off, it was only just up the road. No sooner had we left the hotel than the heavens opened, we sheltered under a flyover and then dodged from awning to awning up Hobsons Street (that should have been an omen) we finally got there damp at the edges and a bit windswept but ready for lunch! We took the lift to the 52 floor and were shown to our table by the window, the view was spectacular as the restaurant slowly revolved completing one revolution an hour. 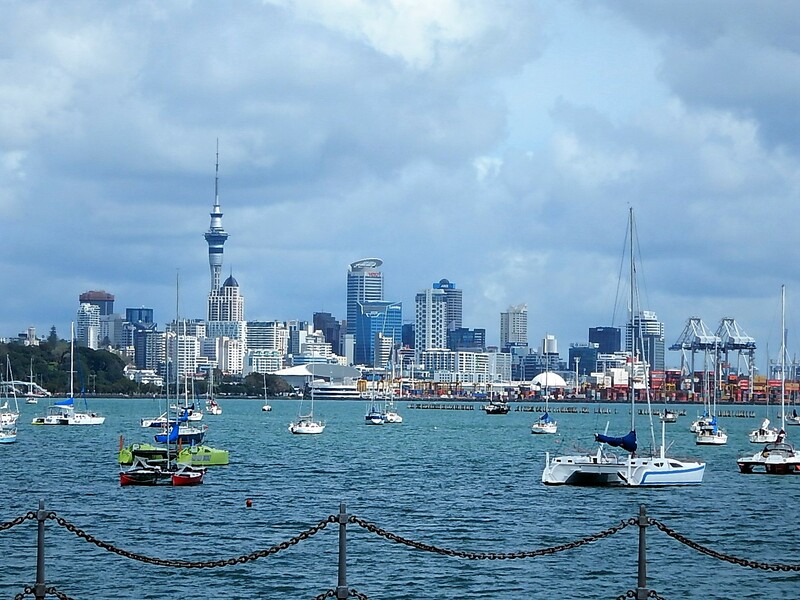 We could see the huge harbour with lots of ships coming and going, the hills formed by inactive volcanoes which dominate the Auckland landscape and landmarks such as the Eden Park rugby/cricket stadium. The food was really excellent too, Mark had an ostrich dish and I had duck stuffed with pistachio nuts and figs, then we shared a strawberry pavlova and a cheese board complete with walnuts and dried apricots and honey to dip them in. We were having quite the sophisticated lunch until we came level with the bungee jump platform on the floor above and with no warning a body flew passed the window – that made us sit up!! On Tuesday we got the bus across town to the Auckland Aquarium which had been highly recommended, it was excellent, we particularly enjoyed the penguin colony exhibit which featured King Penguins and Gentoo Penguins some of which were already nesting. The whole aquarium is underground, housed in the old Auckland sewer system and water tanks, really ingenious. We also took the opportunity to nip back to Queens Street to buy a sat nav for our travels around NZ, Hertz charged NZ$13 a day to hire one and we are driving for about 40 days, you can buy a sat nav for NZ$150, even my maths told me it made more sense to buy one than rent! Wednesday was our last full day in Auckland so, in order to see a bit more of the city we took the Hop-on-Hop-off bus around the city and the outer loop which took us through some pretty suburbs and up Mount Eden the highest point in the area, unfortunately the weather was very changeable and just as we got there the heavens opened so we didn’t get out to walk to the top but even from the bus the view was good. On Thursday morning we checked out and took a taxi to the car hire office to pick up our transport for the next two weeks. First stop is Russell in the Bay of Islands – let the road trip begin. PS Those of you that know Mark well will be pleased to hear that he has ordered his 2016 Christmas mug so we can all relax, Christmas can go-ahead. Delighted you are keeping up laundry skills. What a relief!